In the coming months, works will commence on a new trunk sewer to connect the Integrated Resort Development to existing sewer infrastructure near Turbot Street. Early preparation works have already commenced, with tunnelling operations planned for January 2019. The sewer connection will be 1200mm in diameter and approximately 600 metres long, and will be installed using a microtunnelling process by a tunnel boring machine. Further information will be made available once the design for the new sewer is finalised. Meanwhile, the excavation of Queen’s Wharf Brisbane is on schedule reaching a milestone this month with more than 225,000m3 of material having been removed from Queensland’s biggest basement excavation, which is the equivalent of over 90 Olympic swimming pools in volume. The basement excavation is now deeper than the Brisbane River with the floor of the excavation now close to 20 metres below George Street. The excavation has now passed the halfway mark and contractor Probuild is on track to reach completion by August 2019. 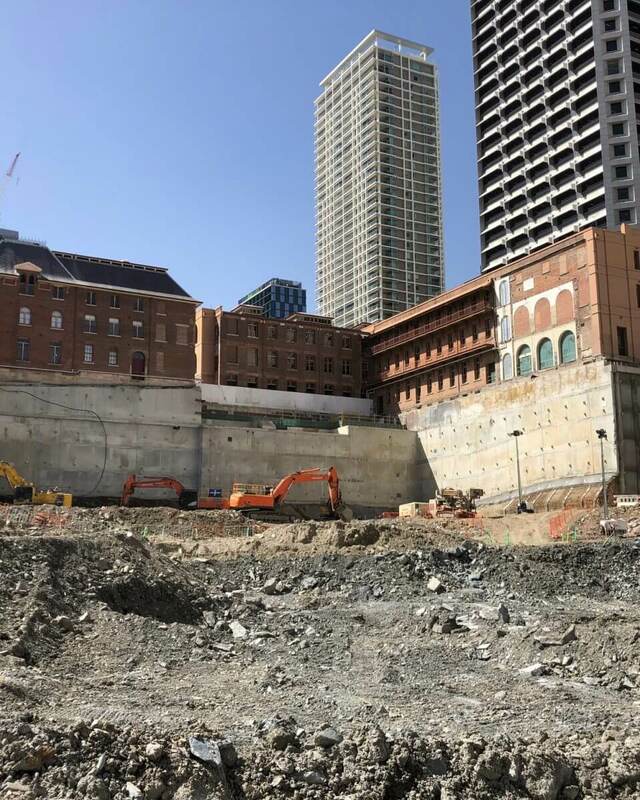 The diaphragm wall which was constructed earlier this year is providing an effective barrier to the river and groundwater as the excavation goes deeper between George St and Queens Wharf Rd. To see the site changes for yourself, watch our monthly timelapse videos on the www.facebook.com/queenswharfbrisbane/ or at our gallery on our website www.queenswharfbrisbane.com.au.